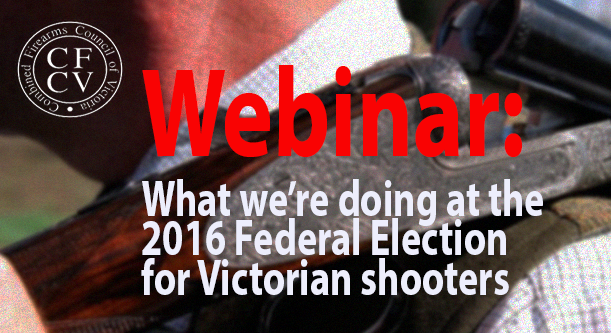 There’s less than 48 hours to go to a first – an open invitation to Victorian shooters to join one of two webinars on the upcoming 2016 Federal Election. Click here to join us on Sunday 1 May at 2pm. With the 2016 Federal Election looming, Victoria’s major shooting organisations have agreed on a political strategy to better position the shooting sports. On 1 May we’ll be holding a brief webinar to give you a high level look at what we’re looking to do and how. We will not be providing specific voting recommendations at this webinar because it is too far out from the election: that advice will be provided at our second webinar, likely to be held in mid June. All you need to view it is a smartphone, tablet or PC.